A geomagnetic storm is a temporary disturbance of the Earth's magnetosphere. Geomagnetic storm also known as Solar storm (or simply magnetic storm) is nothing but the disturbance in the Earth&apos;s upper atmosphere due to large eruptions from the Sun&apos;s corona. These eruptions consists of protons and electrons with few thousands of electron volts known as Plasma. The speed of the plasma as it moves between the planets would range from 10 to 2000 km/s. This plasma would reach the Earth&apos;s surface 21 hours after its eruption. The pressure of the plasma is transmitted to the outer edge of the Earth&apos;s magnetosphere. Hence it causes a drastic increase in the geomagnetic field over the entire globe. Aurora Borealis The bright dancing lights of the aurora are actually collisions between electrically charged particles from the sun that enter the earth's atmosphere. The lights are seen above the magnetic poles of the northern and southern hemispheres. During the initial phase of the storm i.e., between 2 to 6 hrs, there would be increase in the amount of the geomagnetic field. This causes the newly created magnetic lines to contract rapidly and send the plasma from the magnetosphere towards the night side of the Earth. This plasma injection leads to beautiful display patterns in the polar regions known as aurora borealis or aurora australis. It is also known as polar substorm. The initial phase of the geomagnetic storm is followed by the main phase of the storm which lasts for about 12 to 48 hours. During this period, the horizontal component of the field decreases due to the inflation of the magnetic field by the incoming plasma. The last phase of the geomagnetic storm consists of slow draining of the plasma making the geomagnetic field to its normal state. The Geomagnetic storm usually lasts for 2 to 3 days, during which the interplanetary magnetic field turns southward and remains for an prolonged period of time. The most spectacular event that may cause a geomagnetic storm is a solar flare, which is an explosion in the corona of the Sun that releases an enormous amount of energy in the form of outward streaming particles. What is the cause of Geomagnetic storm? Sun emits endless charged particles in to space. Occasionally it also discharges much larger amounts of matter – called coronal mass ejections (CME) – mostly ionized hydrogen and helium. CME is responsible for the Solar winds which measure up to million degree celsius at the Sun&apos;s surface and reach the Earth at 450 kilometers per second. These particles interact with the Earth&apos;s magnetic field at the poles, and knock off some of the electrons from the atmospheric atoms such as nitrogen and oxygen. These electrons later recombine emitting photons of particular wavelengths example green for oxygen, blue for nitrogen, etc. Solar flare, an explosion in the corona of the Sun, that could cause a geomagnetic storm is shown in the adjacent figure. Effects of Geomagnetic Storm Geomagnetic storms can trigger planet-wide radio blackouts and long-lasting radiation storms. 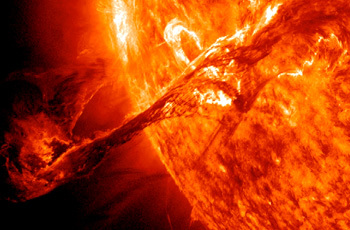 The Solar flares produce high energy particles which are dangerous to all living beings. The Earth&apos;s magnetic filed and the atmosphere protect the surface of the Earth from the solar winds. They disturb the Earth&apos;s ionosphere along with few radio communications and heat up the Earth&apos;s atmosphere. These ejections from the Sun may also consist of large amount of matter and great speed to interact with the earth&apos;s magnetic sphere and it can cause disruptions in communications, electrical power and satellite operations. The tendency to send electricity over long transmission lines makes these systems especially vulnerable to geomagnetic disturbances or storms. The Geomagnetic storms induce geomagnetic currents in the transformer of the power station and thereby more current passes through them which leads to its destruction. Hence it is essential to shut down all the power stations during the Geomagnetic storm. Another serious problem that can occur during a geomagnetic storm is the damage to the artificial satellites revolving around the Earth in Geo–synchronous orbits. The satellite may become highly charged during the storm leading to the damage of the components as the high induced currents passes through the components. The prediction of this type of damage becomes highly impossible. Sun flares observed in 2010 and 2012 These images were provided by NASA shows an eruptive prominence blasting away from the sun observed by the Solar Dynamics Observatory satellite. 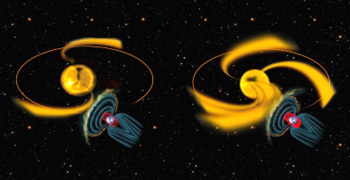 There are two types of Geomagnetic Storms: Recurrent and Non–recurrent. (i) Recurrent storms would occur every 27 days, in correspondence to the rotation period of the Sun. This type of storm is triggered by the south–oriented magnetic field of Earth present in the high pressure regions. Recurrent storms occur most frequently in the declining phase of the solar cycle. (ii) Non–recurrent storms, on the other hand, would occur more frequently near the solar maximum. This type of Geomagnetic storm is mainly caused by interplanetary disturbances which are driven by fast Coronal Mass Ejections (CMEs). The Geomagnetic storms happen fairly frequently. The frequency increases and decreases with the sunspot cycle (irregular dark spots on the sun). If they are intense enough, they could cause damage to satellites, communication and electrical grids, etc. 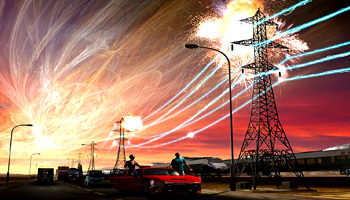 Places like Australia, Canada, China and U.S. where there could be long High Voltage (HV) transmission lines are under severe threat, as the intense geomagnetic storm could attack these power stations and cause a major damage. The intelligence assessment warns that solar super–storms will pose a large–scale threat to the world’s social and economic fabric. The space weather forecasters don't have all the information to exactly predict an incoming storm. As with other natural disasters, the ability to predict a solar storm depends on the accuracy of monitoring and prediction efforts. Unlike hurricane predictions, these are tough to crack as they involve space whether systems which are so vast. The space weather forecasters don&apos;t have all the information to exactly predict an incoming storm. The strength of a CME (Coronal Mass Ejections) is a function of the polarity of the embedded magnetic field in the plasma. The polarity dictates whether the storm will be short–lived or very strong, etc. The stronger storms are more likely to induce geomagnetic currents. But we don&apos;t have that information until the storm is very near Earth. Impact of Solar Winds The Sun produces a solar wind — a continuous flow of charged particles — that can affect us on Earth. It can, for example, disrupt communications, navigation systems, and satellites. 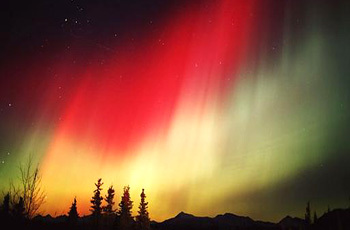 Geomagnetic storm that occurred on July 22nd, 2009 was rated as the strongest geomagnetic storm. This storm occurred at the same time as the solar eclipse reached its maximum. The large amplitude oscillations of the magnetic field were recorded and such large amplitudes were not observed before one year. It lasted for 9 hours approximately. One can minimize the effects of Geomagnetic storm by replacing the transformers of the power stations with the GIC (Geomagnetically Induced Current) immune models, such as those with three–phase, three–leg core designs, and redesign their systems to tolerate large voltage swings. 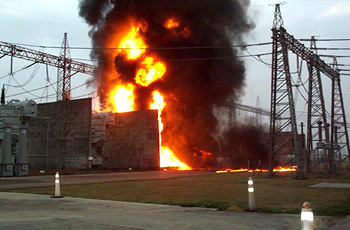 Other preventive measures include hardening buildings and systems, providing backup communication alternatives for system operators, separating interconnected systems into several non–synchronous islands, balancing loads between transmission lines and improving and exercising recovery capabilities. While it is likely that the solar sail could be built and deployed with current technology, beaming the energy it harvests from the solar wind will take a little more time to figure out. Can we generate electricity using Geomagnetic storms? Theoretically we can generate huge amount of currents, but practically it may not be possible as the geomagnetic storms occur at different regions at different times and is hardly predictable. Moreover the current that can be generated is DC. Till now proper measures were discovered to account for the damage that a geomagnetic storm causes after a deep analysis. Let us wait for a golden future with the developments in modern technology to develop an entity that can generate power using a disaster. Until then, we will have to be content with solar cells. 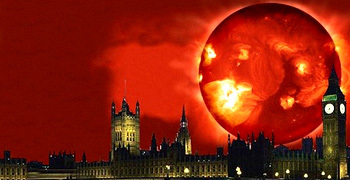 Intelligence community warns solar storms could collapse electric grid (An electric grid is a network of synchronized power providers and consumers that are connected by transmission and distribution lines and operated by one or more control centers). 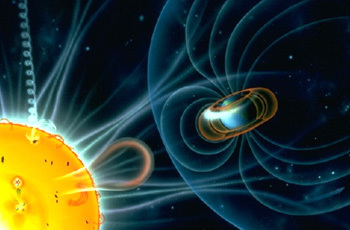 The solar storm is interconnected with the planet&apos;s geomagnetic field and hence affects man&apos;s life. The storm could lead to electrical disruptions. 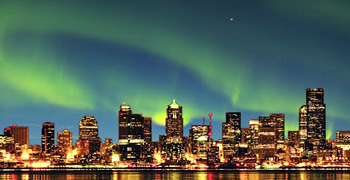 A power outage could leave the Western nations without electricity for months in the event of a strong geomagnetic storm. It could be the most inevitable event in the future. The intensity of Solar storm increases as it is going to reach the solar maximum (by 2015) which occurs once in every 11 years of the Solar cycle. The super Solar storm could approximately appear once in every 150 years, the last was the Carrington event in the year 1859. 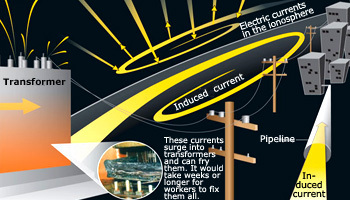 A super Geomagnetic storm could cause disruptions in electrical lines all over the world.